Please excuse the poor photo quality. I once again used my pocket camera in a low light. I really need to dig the boxes in the closet tomorrow and look for my canon rebel xti. I was craving for the empanadas the other day and decided to make some. Empanada is also one of my favorite snacks. Every celebration (fiesta, birthday’s, Christmas and etc.) my mama and Lola always make this goodies to perfection. I like my empanadas without the raisins for some reasons. I am not crazy about the sweet taste very much. Heat oil in a pan over medium heat. Sauté` onion, garlic until tender. 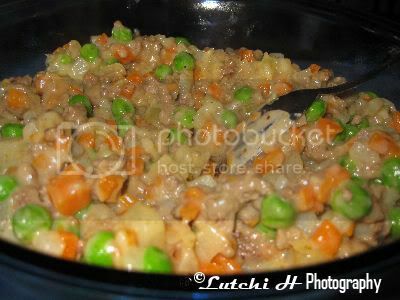 Add ground meat until brown. Add potato, carrot and water. Cook until tender. 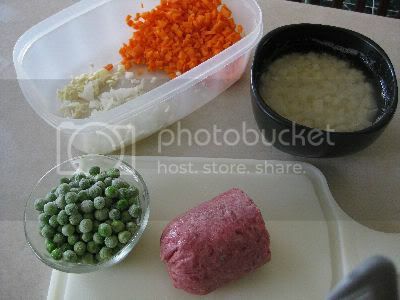 Add green peas and cook for another minute or two. Season to taste. Set filling aside and cool completely before using. 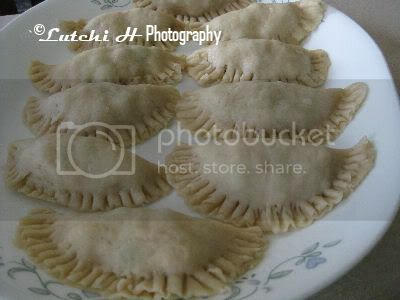 I have tried several dough recipes to make empanadas but this dough by Latin Caribbean Food at About.com is one of the my favorites. It’s very easy and it taste just right. 1. Take your dough out from the fridge and place in a floured surface. 2. Roll the dough out into a 1/8 inch thick. 3. Cut the dough into circle with round cookie cutter or anything that you can think that you can use. (I used biscuit cutter, the biggest one). 4. Place filling in the center of the circle and carefully fold over the circle with filling to make a half circle. 5. Press the edges together to seal (you can either use your fingers or a fork). 6. Bake in preheated 375 degrees for about 15-20 minutes.